When you say South Korea, Seoul is usually the first city that comes to mind. In fact to a lot of tourists, it’s the ONLY city that comes to mind. But just like any other country, South Korea has a lot of hidden gems aside from its capital that are worth discovering. One of which is the province of Gyeonggi-do. Located 40 minutes away from the Incheon Airport, this charming province that surrounds Seoul was our first destination. 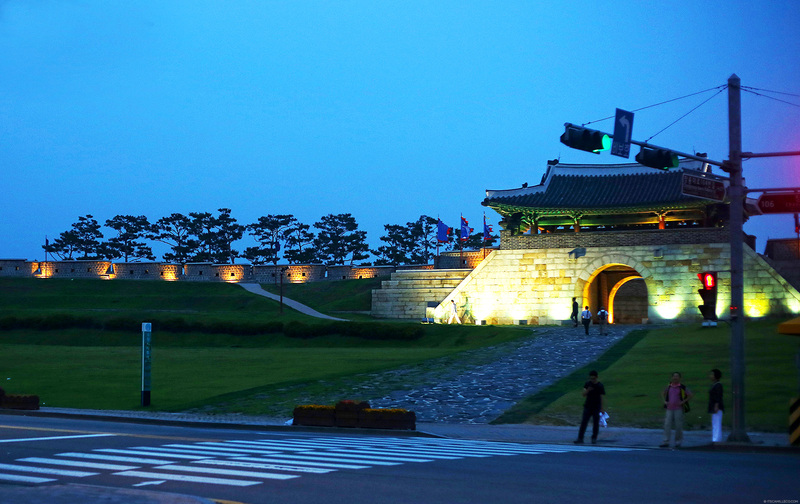 Gyeonggi-do has a lot of interesting places to visit like DMZ (De-militarized zone), Korean folk village, royal tombs, museums, spas, K-drama film sites, theme parks and more. Unfortunately though, we only had a little less than 2 days in the area so we weren’t able to visit all of them. We were, however, able to visit its number one must-see tourist destination (number one at least for me)–the Suwon Hwaseong Fortress. You guys should know by now how much of a sucker for historical and heritage sites I am so it should come as no surprise that this is my favorite out of all the places we visited in Gyeonggi-do. 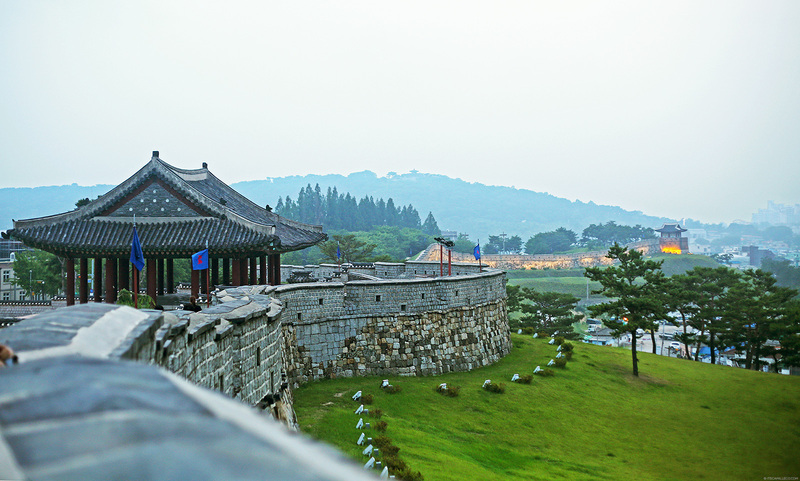 This 6-meter high, 5.7-kilometer long fortress was built during the latter part of the Joseon Dynasty from 1794-1796 by King Jeongjo. 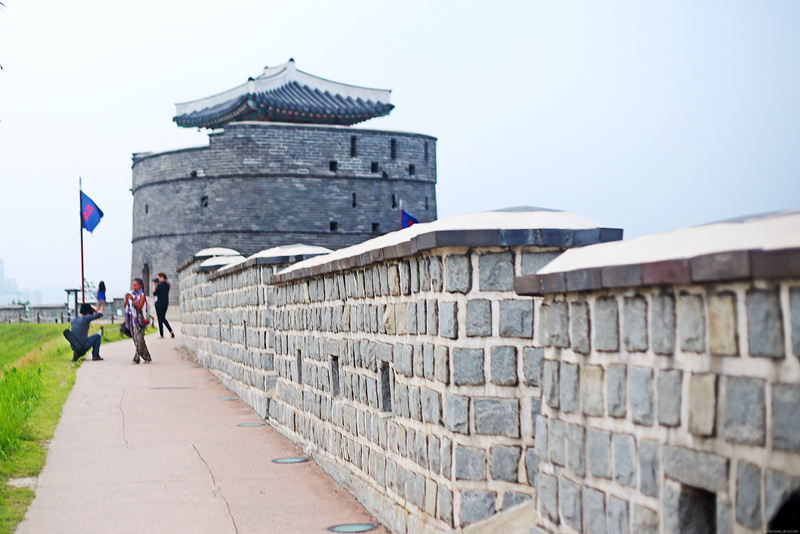 It is said that he constructed this fortress because he planned to move the capital from Seoul to Suwon. The king wanted to escape the factional strife of Seoul palace life and the bad memories the city holds for him. You see King Jeongjo’s father, Prince Sado, was murdered by his grandfather in Seoul after learning about Prince Sado’s mental illness and careless killings. 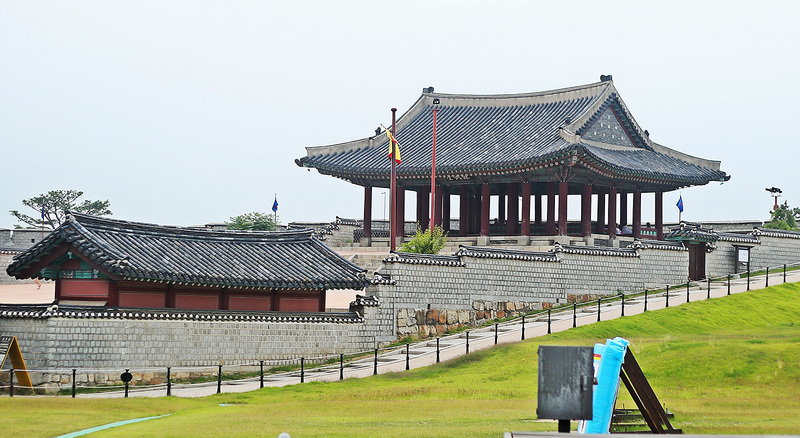 Since Prince Sado’s tomb is at Hwaseong, King Jeongjo built this fortress not only for defensive purposes and to form a new political basis for reform but also to honor his father’s tomb. The King stayed in a temporary palace here whenever he did memorial services for his father. 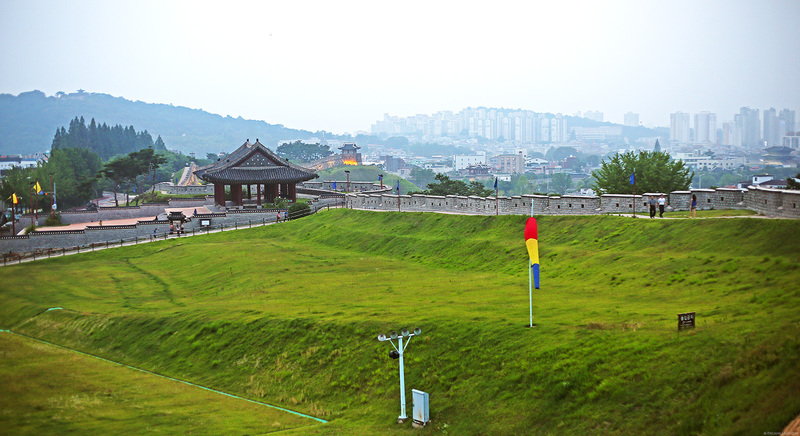 The fortress was designed to protect this temporary palace plus Suwon’s village from foreign invaders. Most of its defensive features like floodgates, observation towers, command posts, arrow launcher towers, firearm bastions, angle towers, secret gates, beacon towers, bastions and bunkers are still intact. 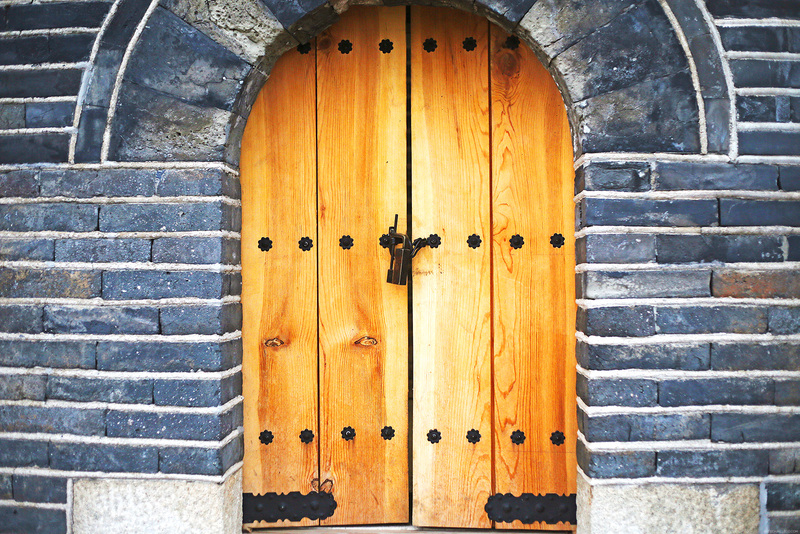 Its distinctive features include its four main gates–Paldalmun Gate (South), Janganmun Gate (North), Hwaseomun Gate (West) and Changnyongmun Gate (East). 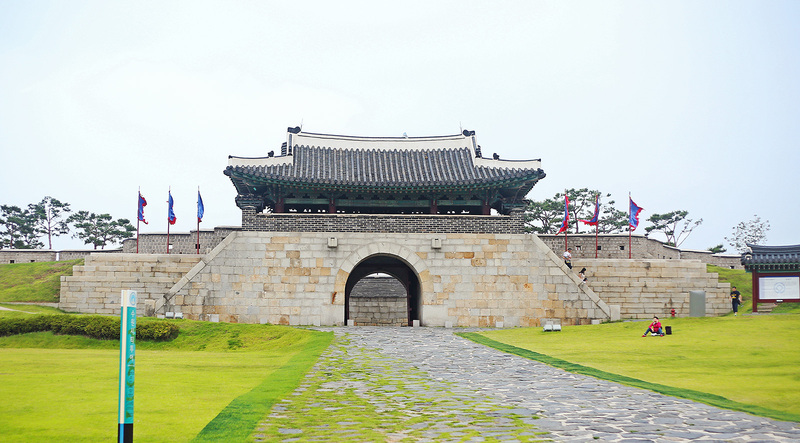 If I’m not mistaken, this photo shows the Janganmun gate, which is the the largest gate in South Korea. Scroll down the photos below to see the rest of this masterpiece. 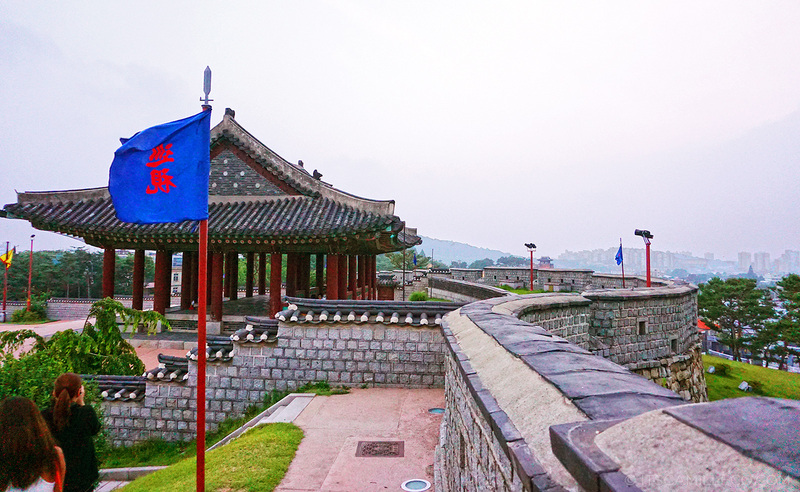 The Suwon Hwaseong Fortress was designated as a UNESCO World Cultural Heritage in 1997 for its unique blend of Eastern and Western military architecture. I don’t know much about military architecture but personally, I love how this fortress isn’t all gray stone walls. It’s got colorful details here and there too! Special thanks to AirAsia Zest and KTO! You look like an angel in that dress! Actually your face always look like an angel. I actually think that you’re an actual angel. You were a God given gift to me, coz you have inspired me so much (okay it’s getting cheesy and embarrassing na i’ll stop hihi) who took your outfit shots anyways? It’s sooooo good!!!! That history and your flowy dress! hehe. Thank you Katrin! I got lucky I guess! :) Your bucket list is getting longer! Those pictures are absolutely breathtaking!!! You are making me want to travel even more than usual haha!! And of course your outfit is awesome too!!! Thank you Camilla! More photos coming! Thank you Kaye! :) And breezy outfit too! Aaaah! You are seriously making my travel bucket list longer than ever Cams. LOL. But I guess it is for the better. After all, I’m a travel junkie and all I need to do now is to save, save, save so I could travel, travel, travel. I really love your travel diaries. I’m a sucker for historical places too and as I’ve said before, the charm of old cities and places attract me. Oh Korea, when will I see you? I love that second to the last photo. You look so regal. It’s a good juxtaposition of ancient days and modern fashion. So cool! omg did you say k-drama film sites?????????? It looks like a temple and your outfit is gorgeous. Love the bellowing dress against the fortress backdrop. And also lovely accessories. These pictures remind me of the beautiful moments I spend in South Korea! Beautiful dress. Love the easy breeziness. Thank you! I love that too!